If you love being off the beaten path, watching incredible sun rises and sunsets, enjoying the outdoors and watersports, you have found the perfect place on the sandbar of the Outer Banks. Whether you are looking to relocate, discover a second home or find a great investment property, we have it. From ocean front homes and condos, homes high in the dunes or shaded by century old oak trees or on the sound side your choices are vast. Simply enter your criteria in the search form and browse all your choices. I’m here to help you navigate through not only the information, but the process as well. Having been a Broker here on the beach since 1987, I’ve seen a lot of changes and know a lot of history. I can tell you how hard the wind blew in a certain storm, how high the water rose, how deep the snow was. Experience matters when you are considering a property at the beach. I will help you find the perfect property for you and your family. I will recommend other professionals to make your transaction seamless. From lenders, home inspectors, insurance agents, contractors, pool service providers, furniture and appliances stores, property managers, you name it. I’ve got them. 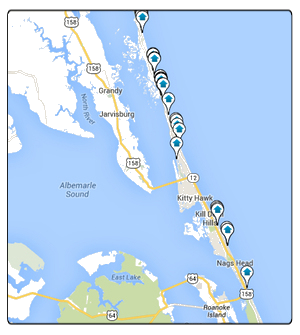 I’ve spent most of my life exploring these Outer Banks from Corolla to Ocracoke. Purchasing a real estate investment is a big decision. You deserve the experience, knowledge and integrity of a seasoned Broker. The beginning of 2017 has shown us that the market is a fairly level field for both buyers and sellers. While interest rates have risen slightly, they are great and historically low. Inventory is good, rates are good and summer is right around the corner. What better time to invest in your future on the Outer Banks?